Ferran Adriá often employs liquid nitrogen in his cooking, but he explains that it’s “just a tool, like anything else.” In a way, it makes sense – like fire or acid, applying liquid nitrogen to food manipulates it, transforming it from one state to another. Liquid nitrogen is pure nitrogen in a liquid state, and it boils at minus 321°F. Pretty cold. It freezes things on contact. To demonstrate liquid nitrogen’s abilities when we were eating lunch together, Ferran had Chef Paco dip a rose into it, and when it emerged, Gwyneth gently flicked it with her fingers. We were surrounded by shattered petals. Santiago Calatrava, the world–renowned architect and sculptor, was born in Valencia. No surprise that some of his most famous buildings can be found in his hometown. The southern part of the city is dominated by his Ciudad de las Artes y las Ciencias – The City of Arts and Sciences – which consists of five amazing buildings. These came in especially handy for Gwyneth when the table was covered with plates of all kinds of pork. It’s important to keep everyone happy! Rub the sardines with just enough oil to make them slick, and sprinkle with salt. 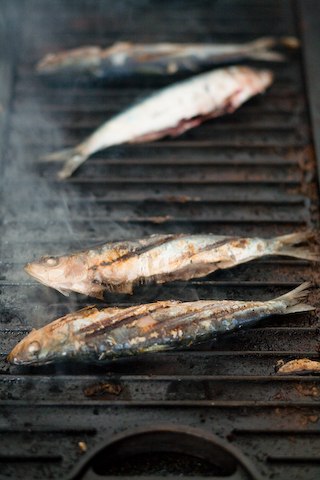 Put over a hot grill fire and cook until well marked with grill marks, 3 to 4 minutes; when the sardines are ready to be turned, they will release easily from the grill. Using a spatula, carefully turn and cook for 3 more minutes, or until just opaque throughout. Transfer to a platter, sprinkle with salt, and drizzle with a little more olive oil. Serve with the lemon wedges. Mario and I saw ‘benjamin’ listed on the drinks menu at Ca’n Joan de S’aigo in Mallorca. We found out that a benjamin is a small bottle of cava, a single serving. Apparently in local slang the benjamin of the family is the smallest child, hence the smallest bottle. Great for sipping with breakfast! Spain has some of the most beautiful golf courses in Europe. I was sure to bring my clubs with me and was lucky to swing them in Galicia, Castilla y León and Valencia. Unfortunately I never got to play in Mallorca on this trip – but it’s got some of my favorite courses. Next time on the road…again. Some of the world’s best salt – huge crystals with a clean, round flavor – is harvested on Mallorca’s coasts. There’s a fun trend of grinding different flavors with the salts – hibiscus and black olives, for example. Mario and Claudia tried them at Felipe Jordi’s apartment in Mallorca with Chef Benet Vicens. The mixtures lend wonderful flavor to meats and fish, pastas and salads. A fun addition to your spice shelf. You can buy them here: http://www.tienda.com/food/products/sp-14.html. Mario and Gwyneth grilled seafood with a local chef at a stunning coastal spot. Simple and unbeatable, this recipe is a lesson in great ingredients. To kill the lobster, hold it firmly on a cutting board with its head toward you, plunge a sharp heavy knife into the center of the head, and quickly bring the knife down to the board, splitting the front of the lobster in half; turn it around and cut it completely in half. Rub the lobster, fish, and shrimp with olive oil and season with salt (including the cavities of the fish). Put over a hot grill fire (start the lobster shell side down) and cook the shrimp for about 2 minutes, the lobster and rouget for 4 to 5 minutes, or until the flesh is starting to become opaque; don’t give in to the temptation to flip too soon. Use a spatula to gently turn the shrimp, and then the lobster and fish, and cook for a few more minutes more, until just cooked through. Transfer to a platter, sprinkle with salt and olive oil, and dig in. In this week’s episode, Mario and Claudia eat Mahón cheese in Menorca while the Fishermen’s Lobster Stew is bubbling away. Mahón is a cows’ milk cheese made in the Balearics, and it’s worth seeking out. It’s strong but not too assertive; firm, but not hard; and it’s delicious on a piece of good bread, alongside a glass of wine, or simply in thick slices straight from the wheel. Apparently in Menorca they usually eat it with a highball of gin and sour lemon juice. Spain is known for its jamón, or dry– cured ham – many say it’s the best in the world. My travel companions regularly indulged their porcine affection. Claudia eats jamón every morning at breakfast, Mario and Mark both slipped slices onto their pan con tomate. I got a lot of slack for not succumbing to the jamón temptation, but there are a TON of special, particular Spanish foods that I’m thrilled to fill my plate with. After all, the more jamón they eat, the more anchoas (cured anchovies), berberechos (a type of clam), and Manchego (the renowned cheese) for me. 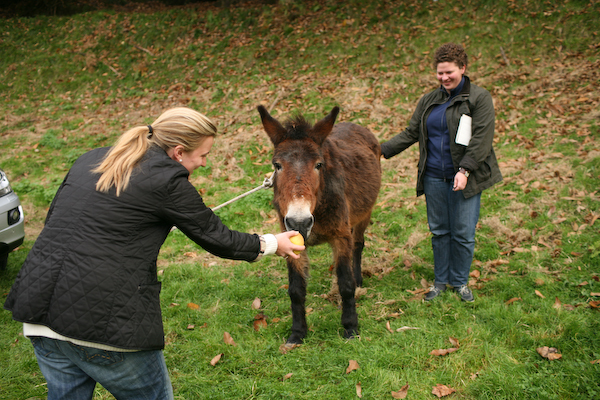 When we went up in the mountains to make fabada, there was a mule on the property. He was very cute and a bit skittish, and while the beans were cooking, we found out that he didn’t have a name. And he’s forty years old. We figured it was about time he got a name, so we called him Bean, in honor of the fabada. Mario, Mark and I ate Can Pineda in Barcelona, a perfect old–school restaurant. It’s small and warm and when you walk in, you know you’re entering a place with years of experience under its belt. The guys who run the place are easygoing, fun and full of personality. When the waiter realized he forgot to bring us our wine, he rushed to fill our glasses and told us a story about how someone in his hometown started eating without wine and then drowned. He’s superstitious, for sure, but lively and quirky too. Pilar baked apples for Mario and Mark for dessert and they were soft and delicious. She gave them some to try in their raw state and they were incredibly crisp – almost too hard. The apples came, unsurprisingly, from her backyard. Use the crispest apples you can find, Macouns or Crispins would be good options. These are especially good with sour cream, ice cream, or even yogurt. 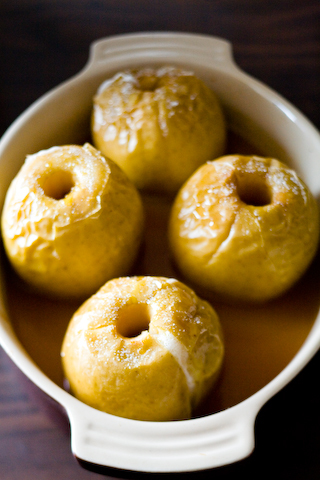 Core – but do not peel – the apples and put in a shallow baking dish. Sprinkle with the sugar and cider. Bake in a 375°F oven for about 1 hour, or until very soft. Serve hot, at room temperature, or cold.